Are you looking for a sporty car at a reasonable price? Have you checked out the Volvo C30 yet? Volvo's entry into the super-mini car class is a leader in its price range and is fast becoming one of the hottest sellers in Europe. We've got all the essential facts about it right here. If you have made up your mind that the Volvo C30 is going to be your next car, then you have chosen wisely. The interior of this car builds on the platform of the hugely successful Volvo S40, meaning you are in for an aesthetically pleasing time when you are driving. Engine choice for this car in Europe is pretty varied, going all the way from a 1.6l inline-4 (petrol or diesel engine) all the way to a monstrous 2.5l inline-5 turbo engine. You can expect a beefy sound system for your cash with a gassy digital 5x130 watt ICE power amplifier featuring Dolby Pro Logic 2 Surround Sound and a whopping ten loudspeakers. As with every Volvo car on the market, safety is paramount. Blind spots are overcome in this car thanks to the revolutionary BLIS system (Blind Spot Information System). You can also expect four-wheel anti-lock braking system, electronic stability systems and a traction control system. Front, side and curtain airbags are fitted as standard too. If all of this has piqued your interest, then a brand new Volvo C30 can be purchased from as little as £15,295 on the road. Don't miss out on this super car! 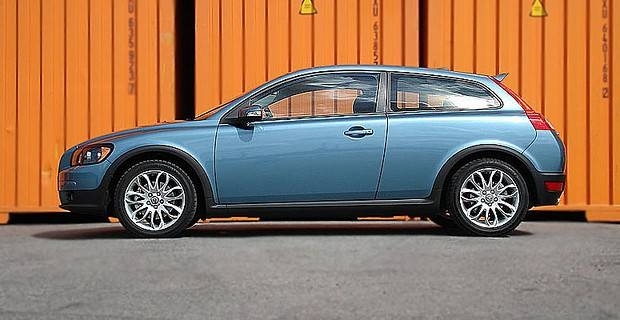 The Volvo C30 is a rare car that mixes affordability with performance and safety. The car comes in enough engine types that even the choosiest driver will find something to satisfy themselves. For us, it ticks all of the boxes and we can't recommend purchasing it enough. Check it out today!